INTRODUCTION: Severe obesity is associated with sedentary behavior, low fitness, and metabolic dysmetabolism. Exercise can improve strength, fitness, and metabolic health independent of weight loss in obese patients. Progressive Resistance Training (PRT) is particularly beneficial in modifying body composition, developing musculoskeletal strength, and improving metabolic health. To date, there has been no investigation that measures strength, fitness, and physical performance following a PRT exercise protocol in Class III obese candidates undergoing surgical treatment. 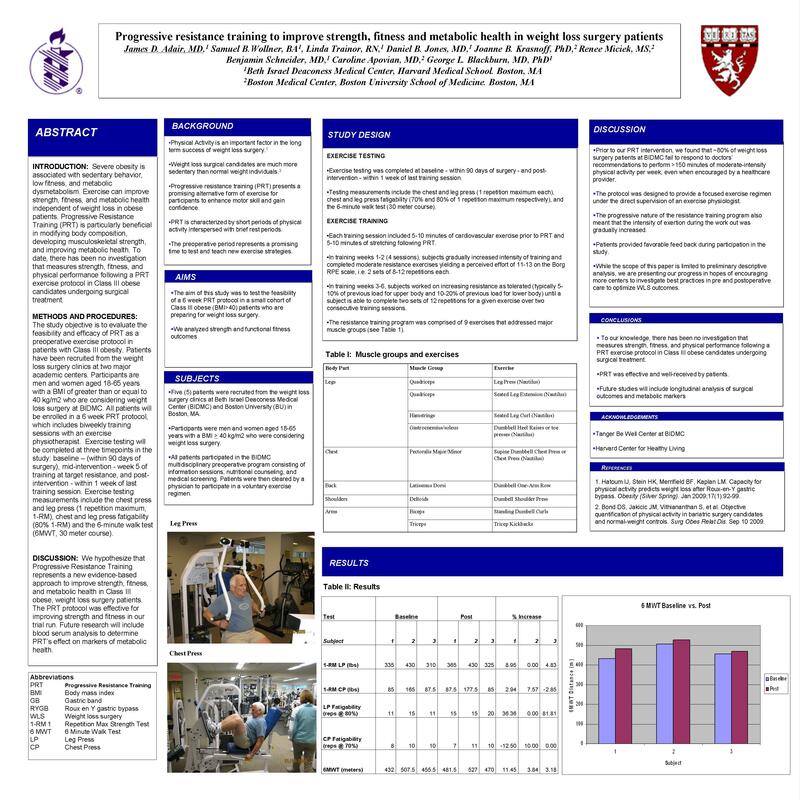 CONCLUSIONS: Progressive Resistance Training represents a novel evidence-based approach to improve strength, fitness, and metabolic health in Class III obese, weight loss surgery patients. The PRT protocol was effective for improving strength and fitness in our trial run. Press and fatigability data may prove more sensitive than six minute walk to assess early impact of PRT. Future research will include blood serum analysis to determine PRT’s effect on markers of metabolic health.